The image is beautifully stripped of any distractions from a colour perspective, enabling the viewer’s eye to be drawn across from the left of frame to the subject. The horizon is placed at one third vertically, making sure it doesn’t distract by bisecting the image across the middle… I am still amazed how often I plonk the horizon in the middle of my images still to this day! 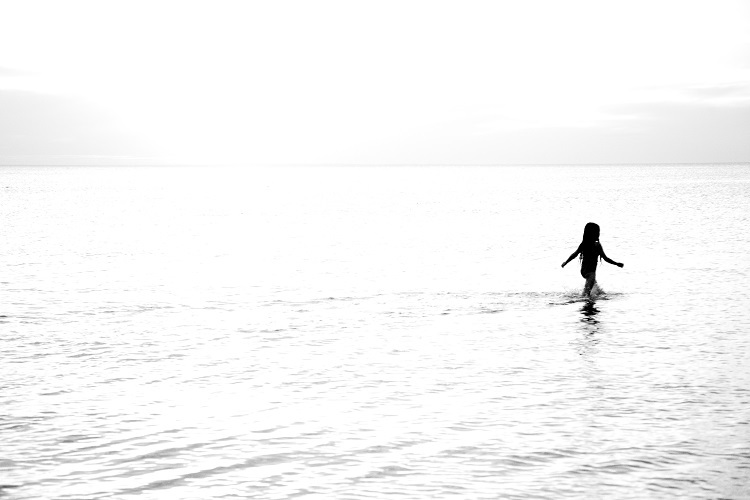 The subject’s figure to ground ratio is very high – her silhouette contrasts easily with the water, making it the feature of the image. 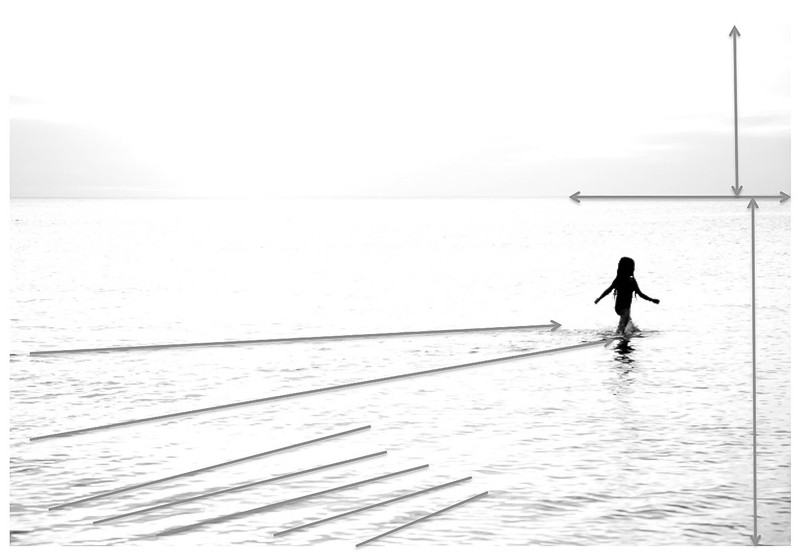 This is supported by two leading lines, the ripples from her movement across the water – which I positively love! They form a natural pointer to the subject, leading the viewer’s eye easily. The additional parallel lines in the bottom left corner, created by the waves, assist in creating a dynamic image. A great example of Andrew’s capability. Talk to me about Street Photography. “Big important events are recorded by anyone and everyone. Simple life in the street is missed, the interaction between people in the the street is missed, buildings old and new are ignored. This is where the Street Photographer fills the gap. He records this so that generations not only in the present but also in the future can see how life was during all periods of time. “About 7 years ago i purchased a second hand Canon 5D mark 1. I believe many photographers call it a work horse. I love it. Once dropped approximately 2 meters onto concrete in New York and it soldered on without any problems. I have used it the rain, deserts, hot subways, rainforests and it has never let me down. MSP : There is a lot of purist talk about wide angle lenses being “true” to street photography, and if your shots are no good, you are not close enough! I love longer focal lengths when out and about – with one of my personal favourites being 135mm in 35mm format. Longer focal lengths get more of the person, less of the street – which is the right formula sometimes. “Always have your camera when on the street, my best shots have always come at the most random times. Know the basics but forget most of the technical stuff, Look for life happening on the street, light doing something special between the buildings, and people interacting. MSP : Always pay the busker! They work hard for the money… and I don’t think I own a camera without aperture priority shoot mode! MSP : You can often catch me with a pint at Curtain House Roof Top bar! What is it that keeps you shooting? “Being able to capture real life moments instead of studio posed lead me to street photography. Old photos showing the people on the street and how cities used to look intrigued me and I loved how they showed what life use to be like. I want someone in 50 -100 years time to say “wow, check out how they use to look and what Melbourne use to be like”. MSP : Thanks for your time today, Andrew! Andrew is exhibiting soon – you can check out his work at the exihibition.